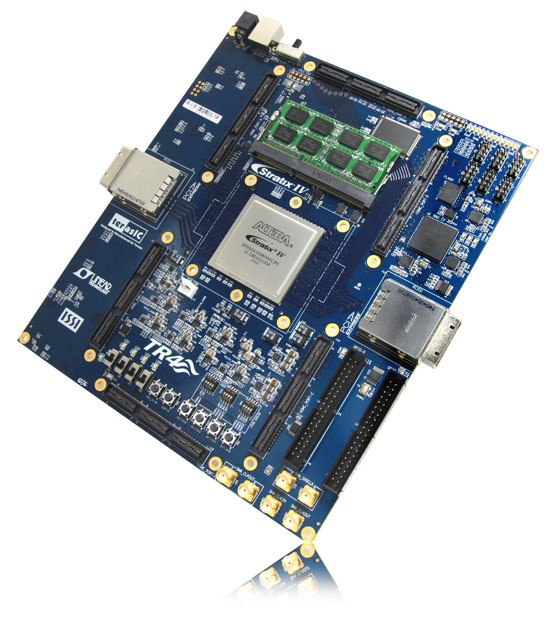 The TR4 Development Board provides the ideal hardware platform for system designs that demand high-performance, serial connectivity, and advanced memory interfacing. Developed specifically to address the rapidly evolving requirements in many high end markets for greater bandwidth, improved jitter performance, and lower power consumption, the TR4 is powered by the Stratix® IV GX device and supported by industry-standard peripherals, connectors and interfaces that offer a rich set of features that is suitable for a wide range of compute-intensive applications. The TR4 is supported by multiple reference designs and six High-Speed Mezzanine Card (HSMC) connectors that allow scaling and customization with mezzanine daughter cards. For large-scale ASIC prototype development, multiple TR4s can be stacked together to create an easily-customizable multi-FPGA system.